Beware! We introverts have had it with being misunderstood and are coming out of our reclusive hideaways, however briefly: for briefly is all we can manage before we scurry back into our restorative sanctums because we can only stand exposure to you tiresome extroverts for so long. I have decided to revisit this topic which I first blogged about five years ago, here, here and here, because doggone it, it seems to be gaining some traction. I am coming to this conclusion because within the past month or so, I have come across two posts on Facebook, each linking to a different article on the topic, the latest being “Caring for your Introvert” in Atlantic Monthly. 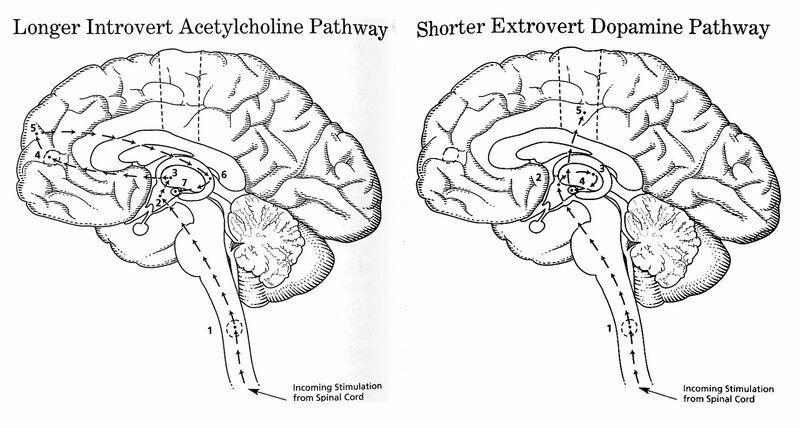 I suppose the main ideas from the three articles and one book that I have read on the topic that introverts’ brains simply work differently than extroverts’ brains utilizing different chemicals and different and longer neural pathways (see the final paragraph and accompanying diagram). The result is that we behave differently. Introverts, for example, find small talk difficult and large social gatherings draining. After a certain amount of social exposure, we need to withdraw to recharge our batteries before the next onslaught. Despite widespread opinions to the contrary, we are not necessarily shy although we may seem to be because we have less to say in social situations. We like to think before speaking, and we therefore frequently don’t get around to contributing to a discussion because the conversation will have moved on to other topics by the time we have thought a notion through to our satisfaction. Conversely, extroverts often think by talking rather than before talking. I have seen the thinking process in extreme extroverts and have been able to witness their thought process as they adjust and modify their ideas during a discussion, sometimes seeming to almost contradict themselves. Personally, and perhaps this also has to do with causes other than introversion, I find that I often process information akin to how a cow digests its food. It’s as if I absorb the information on one level but that I don’t actively do anything with it until later when it for some obscure reason wends its way back into my consciousness. For example: one day last summer, my brother-in-law and I were discussing religion as we are wont to do. The notion of communion/mass/the-lord’s supper came up in the conversation, and he mentioned something to the effect that other ancient religions had their versions of this sort of ceremony. At the time I nodded rather blankly, but hours later in the middle of a concert in the park if you can believe it, the topic resurfaced in my brain, and I remembered that the cult of Dionysus had such a ceremony and that Saint Paul came from a main centre of that cult. I didn’t think it was, therefore, a coincidence that Paul had been the one to introduce the practice into Christianity. However, the appropriate moment had long since passed, and I was never able to convey this interesting and perhaps very relevant tidbit to the conversation. I mean to say that was rather late in the day in and at an inappropriate place and time to make any attempt to rescue my credibility in these matters. Those are some of my thoughts and experiences. Following are a few excerpts from the Atlantic Monthly article although I recommend that you click and take a few minutes to read it for yourselves. It is written somewhat humourously and tongue-in-cheek as opposed to in a scholarly vein, but it contains some good thoughts and information. Science has learned a good deal in recent years about the habits and requirements of introverts. It has even learned, by means of brain scans, that introverts process information differently from other people. Introverts are not necessarily shy. Shy people are anxious or frightened or self-excoriating in social settings; introverts generally are not. Introverts are also not misanthropic … Rather, introverts are people who find other people tiring. … after an hour or two of being socially “on,” we introverts need to turn off and recharge. My own formula is roughly two hours alone for every hour of socializing. This isn’t antisocial. It isn’t a sign of depression. It does not call for medication. For introverts, to be alone with our thoughts is as restorative as sleeping, as nourishing as eating. Following is what I think is a helpful image that I scanned from The Introvert Advantage by Marti Olsen Laney. It shows that the brains of introverts and extroverts operate with different chemicals and that the introvert’s pathway to processing stimuli is much longer and involves more steps — 7 long steps as opposed to 5 shorter ones. No wonder we find it difficult to keep up with small talk and rapidly moving conversations. I apologize for the quality of the scan, but I think you can see the steps, and you can click for a larger view if you wish. This entry was posted in Thoughtfulness and tagged introversion. Bookmark the permalink. Mmmm, my husband is definitely an introvert. Although he can be wonderfully social, he prefers to be alone or alone with me. I think I fall somewhere in the middle. I didn’t hear any mention of that!! When I started first grade, I refused to speak…for six whole weeks teachers, mom & dad, did Everything they could think of to fix the problem. I was simply angry at my parents for leaving me. As I grew older, I would listen to my friends say and do things that I thought entirely idiotic…so, I started speaking out..I stopped being introverted when I learned how much more fun you could have being an extrovert!Hahaaa…..
Ah, AC, yet another common element we have: introversion. Give me one on one conversation about in-depth topics ANY DAY. Small talk, bah! I hate it. And, after a party, I need lots of quiet time to recoup. As an introvert who works with people all day, I have to take a break from them after a few hours. I cannot bear the lunch room, preferring the outdoors, the river and birds. That being said, I really do enjoy being around people but in limited doses. I grew up with a very introverted parent and a very extroverted parent and I married someone who is more extroverted than myself. sometimes over the last 30 years, I test as an introvert, sometimes an extrovert. sometimes I am sitting right on the line. Maybe I have 6 steps instead? I’m hyperverbal these days so extravert-tilted…perhaps. I recharge from solitude and from social.